Last Saturday night featured a mix of accomplishment, disappointment, and question marks in the sport of boxing. The light heavyweight division saw the rise of contender Sergey Kovalev (20-0-1 18KO) as he put himself in title shot discussion with an impressive 3rd round knockout of former world champion Gabriel Campillo (21-5-1 8KO). In the past, Campillo had been on the wrong side of controversial decision losses to the likes of Tavouris Cloud and Beibut Shumenov. Kovalev wanted to make sure that there would be no doubts of his ability in this fight. The Russian-born fighter took advantage of Campillo’s tendency to start slow by immediately putting pressure on him and mixing his combinations to the head and body. Campillo never found his rhythm because of this. The end started with a short, sharp left hook to Campillo’s chin. The Spaniard staggered to the corner and was trying to survive the rest of the round. After a series of punches, a right hand to the jaw would finally drop Campillo. The second knockdown was due to another left hand by Kovalev. Campillo looked completely dazed and spent but he decided to stand up and try to fight on. A second crunching right hand to the face put Campillo on his back. The referee decided that enough was enough and waved the fight off. With this victory, Kovalev could get a title shot with the winner of the Tavouris Cloud- Bernard Hopkins bout or with Chad Dawson. As for Campillo, he’s going to need to mount a fast comeback as he is 34 and not likely to get any better. Moving down to the middleweight division, undefeated titleholder Gennady Golovkin (25-0 22KO) beat fringe contender Gabriel Rosado (21-6 13KO) to a bloody pulp but looked more human than we’re used to seeing, especially considering he has looked like a miniature version of a prime Mike Tyson in his last few fights. Golovkin dominated the entire fight by putting immense pressure on Rosado and landing hard power shots throughout the bout. However, Rosado showed that he came to win by utilizing lateral movement and landing enough shots to cause swelling under the eyes of Golovkin. The flaws that Golovkin showed were mainly defensive. The fact that he never seems to move his head left him vulnerable for some of Rosado’s shots. It appeared that due to Golovkin being so focused on offense, he was sacrificing an awareness of anything that Rosado tried to throw back. There was no question of Golovkin’s offensive skills, as he opened a cut over Rosado’s left eye with a sharp jab in the second round. 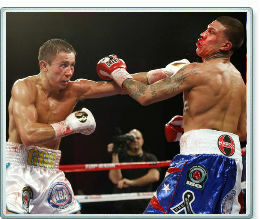 His punches also bloodied the nose and mouth of Rosado as well. During the seventh round, Rosado’s corner finally threw in the towel, realizing that their guy was simply taking too much punishment. Since Golovkin actually looked beatable and not his usual monstrous self, other notable middleweights such as Sergio Martinez, Julio Cesar Chavez Jr., and Peter Quillen may be more inclined to fight him. Rosado showed a lot of guts and determination but he should avoid getting into another beatdown like this if he wants his career to last. More reports on other notable fights to come.